Creative midfielder Jacob Butterfield has outlined what he hopes to achieve over the next nine months at Hillsborough. The 27-year-old, signed on a season long-loan deal from Derby County on deadline day, is looking to recapture his best form and play a major role in the Owls’ promotion bid. Butterfield, who confirmed Wednesday tried to sign him on a permanent basis, told The Star: “I want to get a place in the team and contribute in a positive way. “Looking on a bigger scale, I want to get back to the form that I have shown in different spells over the last five to six years where I have been one of the top midfielders in the Championship. “I think last year was disappointing. I still played 45 games at Derby under three different managers which speaks for itself. “With all the changes and stuff going on, I never really managed to hit the heights that I had hit in the two previous seasons. 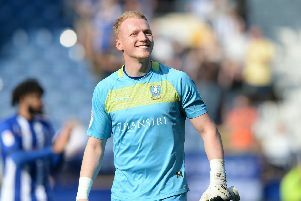 “It was disappointing but I think there were reasons behind that but I think Sheffield Wednesday is a great place for me to rediscover my best form. “It would be huge to me to be part of a promotion winning team. I went to Derby a few years ago with aspirations of achieving that but it hasn’t quite worked out for a number of different reasons. Butterfield lined up in Derby’s midfield at the beginning of this season, starting their opening two league fixtures. But he lost his place in the side after Rams boss Gary Rowett switched formation, prompting him to consider his options. “I spoke to my agent early last week and just said Derby’s style of play was not really the way I like to play my football,” said the former Barnsley trainee. “I just had a feeling that he [Rowett] wanted to play a more direct, physical style. “I said I didn’t want to spend the season on the bench and my agent made some calls and I had a few options. “Initially Derby were not considering a loan but I think as deadline day went on they needed to move some players to release some funds to make signings. “I had a few options but Wednesday made their interest known on Thursday afternoon and it all happened very quickly. Hillsborough is a ground which brings back special memories for Butterfield. He claimed his first league goal in Barnsley’s 2-2 draw at S6 in August 2009. Butterfield said: “I’ve had a few eventful games at Hillsborough. “It’s a ground I really do like. “I like the older stadiums with a bit of character to them. Hillsborough is different to a lot of the new grounds that you see. Butterfield is in contention to be involved in tomorrow night’s televised showdown with Nottingham Forest, kick-off 5:30pm. Wednesday chief Carlos Carvalhal must decide whether to play Butterfield from the start or keep faith with David Jones and Barry Bannan in the middle of the park. Bannan is expected to be passed fit despite pulling out of the Scotland squad last weekend due to a foot problem. It promises to be a tough assignment for the Owls as Forest currently lie sixth in the table after recording three wins from five matches. Butterfield said: “It will be a tough game. I like the manager at Forest (Mark Warburton). He’s a good manager and he likes to play good football. “From what I have been told, they are playing good football this year and have had a decent start. “We know it will be a tough test but so is every game in this league. You have to be at your best all the time to get results.